You will find these instructions (or some variation) on most shampoo bottles. Why include these instructions in the first place? Does it mean that the shampoo is actually not that good and you need a double dose? Or, could it possibly be they think you are extra dirty and need the extra round of cleaning (which might be kind of insulting)? Actually, it is neither of those reasons. The shampoo is not necessarily faulty, nor are you likely that gamey. The reason they put those instructions on the bottle is that they know the secret of doing a job effectively. The first round cleans most of the pollution, grease and dirt out of your hair - the next round does a final pass to make sure your hair is actually clean, and not just "less dirty". Other two-part solutions abound - floss before you brush your teeth; your teeth will be healthier if you loosen up the stuff that is stuck between your teeth and then brush and rinse it away. Painting a room? Don't ever believe the "one coat" label on the can or the brush. Every good painter (DIY or professional) knows that you need (at least) two coats for a good finish. One time round is simply not enough, unless you are freshening up the room with the same exact colour within a couple years. But if you change colours, you will need two coats, and possibly a primer/sealer before that to help hide the old colour. And the bigger the colour change between old and new, the more coats you are likely to need to cover it. Not surprisingly, the same approach applies to Project Planning, however we are not limited to just a second pass; depending on the length of your project you may end up doing multiple rounds of re-planning to make sure that things are going to get done effectively. Because - as every Project Manager knows, your project plan becomes obsolete the moment you save it or print it out. Every project plan has a best before date. What that date is depends on a number of factors, including the number of "moving parts", work streams, dependencies and the overall complexity of your project. Even "set in stone" dates can change, for example you have had training booked in from several months ago, and then a tornado flattens the training center in the middle of the night. One way or another, you are going to have to adjust your plans - delay or relocate. As Project Managers, we are actually tweaking the direction every day - usually small changes, adjustments, a day or two here, a resource there. Gradually, bit by bit - the reality of your project wanders off away from the path you originally set out on. You might even need to continue on the path you are on right now - but for everyone involved, it is important that you do so consciously, as part of the plan. Or perhaps you need to get back on track, regroup, assess and re-chart your path back to the destination. When your project is starting to look substantially different from the plan, or every month or so, whichever comes first, you should be reviewing and adjusting the overall plan. Because after all - we don't actually have an auto-pilot. You may not know this, but most commercial aircraft can take off, fly and land by themselves. We are all familiar with the middle part - the flying part, but they can actually do the rest as well. They rarely use it for takeoff and landing, but they do test it from time to time when the conditions are good, with a human hand ready to take over at a moment's notice. Fortunately for us, projects are so complex and conditions so variable that no-one has yet invented an "Automatic Project Manager" to initiate and complete projects. What is worth looking at, however, is how autopilot actually works. Every moment of your flight, you are flying slightly off-course. The wind nudges you a little up or down, left or right. If your plane kept flying in that adjusted direction, you would end up hundreds of miles or more from your destination. Fortunately, the auto-pilot knows where you came from, where you are now, and where you are supposed to end up. So every so often, at least every few minutes, the plane adjusts the rudder or ailerons to put you back on track. Your project does not have an auto-pilot. Which is fortunate, as you would then not have a job much longer. Fortunately, they have you - the Experienced Project Manager to perform that function. As long as you actually do the job of checking your direction and adjusting course back to the destination, that is. If you simply set your plan and then execute your project without checking that you are still going in the right direction, you will easily end up hundreds of miles from where you had planned to in the first place. Or, you might get "stuck in a spin" and fail to make forward progress, and spiral down, down, down until you crash. So you should plan to make regular course adjustments - beyond the minor day to day tweaks. You need to periodically check all of your instruments, see where you are now, and where it looks like you are going, and update your project plan. There is even a Project Management word for what you do when you take stock, verify where you are and update the plan and direction. It is called baselining. It's important enough that they invented a word for it, so we might as well use it, right? Another reason we need to re-look at the plan on a regular basis is that none of us can see very well beyond the nearby stuff - at least not the detail. And most of the time you can imagine, but not actually see the far-off destination, which may still be well over the horizon. So let's start with a Project Eye Exam to see if that can help. In my pre-teens I needed to get glasses. I had them for many, many years until I braved laser vision treatment. Best decision I ever made regarding my eyes - but anyway, the point here is that I needed corrective lenses (and eventually a permanent treatment when glasses could only do so much and things were still a bit fuzzy) to see as well as someone with "normal" vision. But the thing with "normal" vision, or 20/20, is that it is still limited. 20/20 simply means that you can see at 20 feet what a "normal vision person" should be able to see at 20 feet - usually measured by being able to read tiny letters. And really - 20 feet is not that far away. You can throw much farther than that. At 25 to 30 feet, well, almost nobody can read the bottom line. And although those mountains are certainly pretty in the distance, you can't see the ski chalet or the sunbather on the upper balcony, or the title of the book they are reading - let alone the words on the page, which are the same size as the bottom line on the chart 20 feet away from you. The same rule applies to projects - although we generally do not speak in distance, but in time and deliverables. The book that sunbather was reading looks really good - I think I'll go over and check it out. When we draw up our project plans, we can define and be reasonably able to execute tasks on the schedule that are defined in days or even hours - but the further out you go, the details become more fuzzy. And so far, there is no Lasik or project telescope that has been invented that can help with resolving all of those far-off project details. However, some things we can define (barring major risk events) with great precision into the far future - these are the anchor dates, deadlines, due dates and when you have specific booked activities. But for the rest, things tend to be more fluid and variable. And we need to keep these variable things on track if we ever hope to actually meet those deadlines, due dates and be able to deliver training course XYZ on June 1, two years from now. It is the variability of those tasks in progress that require you to keep checking and correcting your course - and adding more and more detail. This is a longer walk than I expected - the mountain looked so close! Well, I am almost there now so I better keep going...but I better grab some snacks along the way and work my way around that wet patch up ahead. You can plan for what you can "see" - and have a rough plan for the next stages of the project journey. You can map things out in great detail to make it to the closest hill, but then you need to assess the lay of the land, navigate around the swamp you did not know was on the other side, and chart your next leg in detail to the next major point or milestone. It is in this way that we navigate through the world and through your projects, and make it to the destination on the other side. - Over the next 30 days, we can define and schedule tasks at the resolution of a day. - Between 30-60 days, the resolution is around 2 days, give or take. - Between 60-120 days, the resolution is at one week. - Between 120-180 days, the resolution is at 2 weeks or more. - Over 180 days, the resolution is at 1 month or more, and will become a summary task with more detail to be added as we get closer. (Note that this is for duration and scheduling of assignments, not necessarily effort, though we will understand that better the closer we are to it as well). Every time we reviewed the project plan and updated it (every month or two, if things were going relatively smoothly, or more often if not), we would review what had been accomplished so far, and then look out over the coming months and break tasks down into finer resolution and detail roughly following the model above. In this way, we had a rolling project plan with progressively more and more detail as we went along - but still a high level overview as we looked out farther into the future. At every stage, the mountains get closer, but they are still just a little ways further off, until you finally reach your destination at the ski chalet. The sunbather is long gone, but fortunately they left the book behind. You are also looking to rent some ski gear, because, well hey - it was a long walk and now it is early winter. But the upside is, you are here in time for ski season - and the powder is fresh, awaiting your first run. And when you finish your last run of the day, you can sit by the fire and read that book you have been looking forward to for so long. This article has taken us on quite a journey - from the label of a shampoo bottle to flying across the country, stopping in for an eye exam and walking long-distance to a ski resort. A mix of metaphors, perhaps, but each had a part to play in the overall lesson. You need to be aware of your perspective when you are developing your project plan - you cannot see very many details past a fairly short period of time (weeks, or a few months). Your long-distance detail vision is not as good as you think it is. You need to Review where you are and add detail for the next group of tasks as you go. You need to make course corrections along the way. You need to Re-Plan to keep things on track, if you start to drift off course. Finally, you need to do it more than once. Perhaps not as often as an airplane, which is every few minutes - but you do need to Repeat it regularly. So the lesson can be summarized as: "Plan your projects, and on a regular basis, Review, Re-Plan, Repeat". Cheers and good luck with your projects. Until they develop a Project Auto-Pilot (and I hope they never do), we will just have to keep everything on track ourselves. We each make thousands of decisions every day. Some studies have indicated that the number is at least 5,000, and possibly up to 35,000 decisions every day. Most of these are small decisions, done subconsciously, or on auto-pilot. The conscious decisions we make every day are far fewer - but still easily in the high hundreds. The important decisions are fewer again, depending on the day. Some decisions may not even seem important until later on. But decisions we make, in the thousands, every single day of our lives. Even when you say that you can't make a decision - that is a decision to leave things as they are. I have a theory about the origin of written language. There are many in-depth philosophical, scientific and scholarly theories and analyses on the origin and stages of writing in its various forms, from proto-writing through the various scripts, hieroglyphs and alphabets. My theory is not about the how or when of when the various forms of written language were developed as proposed by those theorists. My theory is about why written language was developed in the first place - at any place in the world you like, regardless of the time period, style, method or medium. Written language was developed because of all of the decisions we make. More specifically, the important decisions. The oral tradition of history is a great way to entertain and educate around campfires at night, but it is not a very reliable way of passing a consistent message across generations. Each speaker forgets a little bit, adds a little bit, or embellishes the stories a little bit. With every generation, giants get larger (8 foot! no, 9 foot! no, 11 feet tall! ), enemies get more devious, more vicious, and more numerous. Heroes get more and more heroic, until they become larger than life. Details change. The other problem is that people forget things. How many times have you been told something and then have to ask what it was they said? It may not be because you were not paying attention, it may be there was a long list of things to remember and your memory is not that good (or not as good as it was). You also have more difficulty in remembering specific details about conversations held months before, and this is normal. Do you go to the grocery store with only a list in your head, and expect to remember to buy everything (and only those things) on your list? Rarely can any of us do that. Decisions get made, and then they get forgotten, or miscommunicated. I suspect that at least this much about human nature has not changed much over thousands of years. I believe that in every culture that developed a written language, this frustration finally came to a head. "Enough!" one leader finally would say. "I am tired of repeating myself and having things be misinterpreted. If you can't remember exactly what I am telling you, we need a better way to communicate this. I want my decisions to be clearly understood and carried out by all of my people." It probably went something like that. Obviously not word for word, of course, as it was not written down yet (!) However, invention often comes as a result of needing to alleviate great pain, and anyone trying to rule a kingdom by the spoken word alone must have had a lot of headaches. You also had to really, really trust the people you sent out with your commands to get it right and not change it, and remember it as best they could. So a great project would begin - to design some form of written symbols to represent the spoken language. Everyone who formed part of the communication network would have needed to be trained in the reading of the symbols, and the trusted few would be trained on inscribing the symbols. The other benefit of a written language is that the King could expand his empire and maintain consistency of his rule - just look at the expansion of the Roman Empire as an example of what could be accomplished. Most of the population would not have been trained in reading or writing of the symbols - it would have required a lot of effort to do so, and being able to read and write was an elite skill that formed part of the power structure. Carry the written word (symbols, hieroglyphs, script) from the central point of decision making, and then read out those words in the outlying regions - exactly as they had been inscribed at the source. Written language symbols would have most likely been used primarily to record edicts and legal matters - important things, specifically, important decisions. Various mediums would have been tested and used - bark, cloth, animal skins, silk, reed fibre mats and others. Some were obviously more portable than others, and some more durable; some messages were of such significance that they were literally "written in stone" on rock or clay tablets, intended to last for a long time. 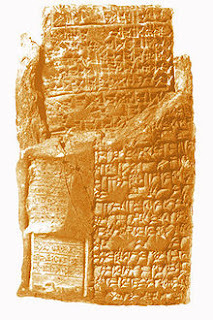 If you look at the various forms of written communication that have been unearthed, many of the less durable materials have decayed, but the more durable (clay tablets and stone) remain readable today. And what do we tend to find on those tablets? Decisions! Royal edicts, legal matters, business records. All outcomes of important decisions. Very few people recorded shopping lists on stone tablets, but you can be sure there were a lot of those too, on less permanent materials. And what are shopping lists but recorded decisions of what you need to buy? Note that literature and "pulp fiction" came much, much later - once the printed word became more accessible to the masses through the invention of the printing press. Going forward to the present day, you will see that legacy remains - most of the written word revolves around decisions, even in fictional stories. You read about the lead-up to decisions, how people wrestle with difficult decisions, the decision as it is made, the outcome of the decisions, the justification for why they made bad decisions, and on it goes. A single book contains thousands upon thousands of decisions, and even dry textbooks describing new concepts to you are the result of others deciding what was important to tell you about the topic. Contracts are just another form of written decisions - what has been agreed to with respect to who is going to do what, who will pay whom, and what any penalties will be for non-conformance, and so on. Requirements documents? Recorded decisions about what they want you to do. There may be some exceptions, in some poetry perhaps, but the primary focus of the written word is still wrapped in the legacy of decision-making and recording the framework of decisions. But is this any surprise, considering each one of us makes so many decisions, every single day? So there is my theory. It might not even be original, as many ideas are variants of other people's ideas, but I think you will agree there is some merit to it anyway. How does this apply to your project? Well, in every project, there are many decisions made every single day. Some are minor, some are major and some are of great significance, either to scope, budget, time frame, or what needs to be done in order to accomplish the project goals. Depending on the size of your project, you may have a formal Decision Log that records the disposition of major decisions that are made by the appropriate stakeholders; in your Responsibility Assignment Matrix you will have identified all of the stakeholders and project team members. A subset of these people, usually the Project Sponsor and a select group of stakeholders will be the key decision makers for your project, and you may possibly have a Change Control Board as well. Make sure that you accurately track all of those major decisions and their outcomes, not only for the project audit, but to help ensure that everyone gets the same message about what those decisions were during your project. For less major decisions, you may not need the Project Sponsor or the stakeholders involved; you may have these only at the level of your project team. The decisions may relate to the scope of the project, costs, time frame, or any number of technical details regarding the execution of your project. However, the key and important message here is to write things down. Most decisions may be arrived at through verbal discussion, but the decision and it disposition (and contributing factors) need to be recorded. This may be on paper, electronic documents or in emails, but get the information into a written form. Don't forget to communicate the outcomes of those decisions - again, in written form. You may talk about them as well, when explaining them in front of a group, but there is more weight when things are written down. Again, we all make thousands of decisions per day, but some need to be recorded, especially as they relate to the project. A good rule of thumb to use is if it materially affects the direction or outcomes of the project (cost, scope, timeline) or is anything that someone may come back to ask you about later on, write it down. Or type it in a log somewhere you can easily find it. This is important because people forget, and their memories of events change and differ over time. If you write it down, both parties can review what was recorded; end of dispute over who remembered what best and who was "right"; often neither of you remember correctly. If in doubt, write it out! Ever since High School I have written things down. You will usually find me with a notebook nearby; however these days I am able to record notes and emails on my phone, so no extra baggage required if I am out and about. But I still use a paper notebook while I work. The interesting thing I have found is that the more I write things down, the better I remember them. And if I do get fuzzy on the details later on, I know that I wrote something down about it a few months (or years) back, and am able to find the reference in a notebook. Sometimes all I write in my notebook is something to jog my memory, or a reference of where the full details are recorded elsewhere - in a document or an email. But even with that small note, I find that I am able to recall the event in detail. Many years ago now, a customer encountered an issue that seemed familiar to me. I knew I had seen it before but could not remember the specifics or the solution - but I knew I had written it down, and approximately which month of what year (three years before). Within 10 minutes I was able to find the reference and recount the full scenario and the solution. It impressed my colleagues and the customer, but it was really a matter of making a habit of writing things down, especially the important things. The only times I have been stuck, unable to recount the full details or an event or decision was when I neglected to record a note in my book. I may have been tired that afternoon and not felt like writing things down...and often, that would come back to bite me. So I still record notes in my notebook - and I have a closet full of them, numbered and going back many years. Of course, I use email and documents for most of my written communication these days, but the principle is the same - I can search through emails, and I will usually remember the year and month when I sent or received it as well. Many ancient societies spent the intense effort to develop various forms of the written word, which have evolved into the various written languages we have today. And they did it all for you - and future generations, so that you can read about past decisions, and record yours for future generations, or at least for communicating within your project team (and for the project audit). Honor the efforts of those many generations and millions of people who labored to develop the written forms of language (just for you!) - and write the important stuff down. Good luck with your projects, and keep good notes. You'll need them for later on. On July 1, 2012, my teenage son and I went to a book signing. My son's first time going to one - and it was for one of his all-time favourite authors. The author was in Hamilton, NZ for the last stop, and last "show" on his tour for the final book in the series. The next day, he was flying home. Dragons, Magic, Dwarves, Elves, Wizards, dark forests - the core elements of every good fantasy novel are in his books. The author spoke with the crowd for nearly an hour, telling of his journey of writing. It was quite an interesting story, and he was a dynamic speaker. At the end, during Q&A one of the members of the audience asked "how do you go about writing a book"? The answer was insightful. 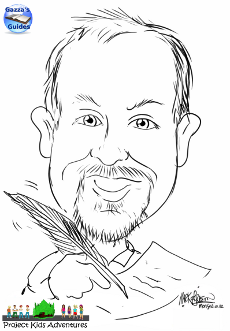 His answer was that it was in exactly the same way as every other author he had met started to write their stories. The authors all started with Questions. "What if...? ", "How about if the character did this...? ", "Why can't we just...?" and so on. That got me to thinking about Projects. Doesn't every project start the same way - with a lot of Questions? And sometimes, a surprise ending. So, in truth - a project really is a story! And probably a good read too, once it is all done. Note that I am not just referring to Agile here, where the "unit of work" is referred to as a story. I am talking about the higher level genre here - independent of your system, methodology (or mythology). Projects (as a whole) are stories. Story drafts of what you would like to achieve - and the final version, where the true ending is not known until the project is finished. Every author starts with an idea, an outline of their story that gets fleshed out as they begin to write. Chapter by chapter, the story grows - usually following the general directions of the outline they started with, but occasionally taking unexpected turns (even for the author) as the story begins to take on a life of its own. It is much the same on our projects. We start with a high level idea, a concept during Project Initiation (the Prologue). We then get into the Planning phase (preparing for the adventure or journey). Then we are off into the wild, wild world in the Execution phase (and unlike many adventure stories, we do want most of the characters to reach the end at least mostly alive). In some stories there is certainly a lot of Executing going on! And during the execution of our projects, we often have to take unexpected turns, retrace our steps and change our plans. And finally, we reach the end - with the victory feast in the Great Hall, celebrating the victory and sharing stories and lessons learned from our travels. (Project Closeout). And overseeing it all is the Narrator (the Project Manager), subtly guiding the story (Project Control). So you have a project to deliver. You have the high level goals, but you are not sure how to get started. You have the end in mind, but you are not sure how to get there. You need to begin crafting your story outline - how to get "there" from "here". In our projects, we have another name for this. We call it the Project Plan, or Work Breakdown Structure (WBS). "Yes, I understand that", you say - "of course we need a Project Plan and WBS. But how do we get started?" If you have worked on similar projects before, you will probably have a very good idea of what needs to happen when, and in what sequence. You will likely copy one of those plans, review the outline, and start tweaking it to write up your draft outline of the WBS for your new project. In this case, you are working along the lines of a "Gilt" novel. (That is not a misspelling.) Gilt, not Guilt. As in the shiny gold lettered covers of most Romance novels. We are not saying your project is going to be a romance, or that it should be treated lightly. What it means is this type of novel follows a prescribed structure, format, or formula - the basic plotline is the same "type", but the characters, location and the model of flashy sports-car the Hero (or Heroine) drives changes. 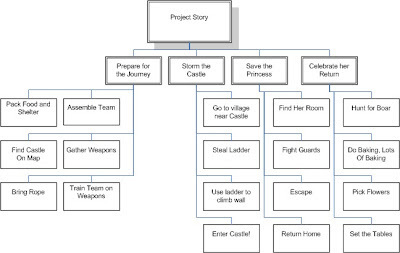 If you have this type of project, you are probably off to a good start and you know most of the storyline already. But what about when you are working on something entirely new, or at least new to you? You need to start from scratch, taking the high level goals and breaking them down into smaller and smaller achievable pieces. You don't go straight from being a farmhand in the village to storming the castle keep in one chapter - you have to meet your band of heroes, train up, gain weapons, learn skills, buy or steal some ladders (and maybe a battering ram) before you approach the castle. In short - we need to literally break things down into a story. You may not have castles, dragons, dungeons or swords - you may have concrete and girders, server rooms and code instead. But the principle is exactly the same. Every project starts with a problem to solve. "The Princess has been kidnapped and taken to the castle!" Goal words and phrases. Things to be achieved. The things we need to complete, to deliver. In our story, these would be the goals of our quests. "We need to rescue the Princess!" Action words and phrases. Actions we need to take, in order to accomplish the goals and complete the Quest. "Storm the Castle" and "Save the Princess" are a good start. Note that these can also be goal words with sub-goals, but they are all about getting things done! Completed action statements (milestones, goal achieved - so we know when we have succeeded). "Princess rescued!" What you will find, as happens in any story, is that there is a grand vision, an overall set of lofty goals to achieve in order to solve our problems - usually at a very high level. So our initial vision statement is deceptively simple. "Let's storm the castle and rescue the Princess!" So, grab your pitchforks and head off into the night! ...Until the wise old man from the village (usually weatherworn, wearing a hooded cape, and a bit mysterious) calls you back and tells you that you are not ready to go quite yet. 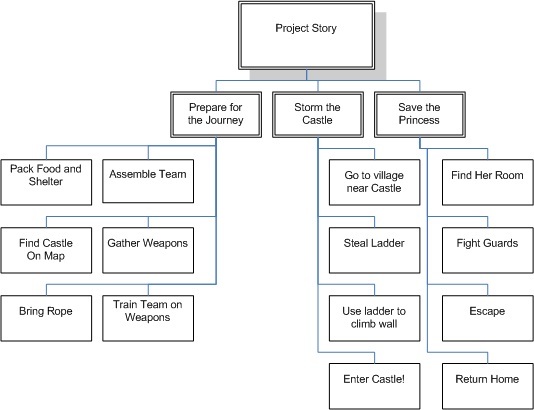 You need to Prepare, and then you can Storm the Castle and Save the Princess. We need to prepare, and put a bit more detail into our plan. We need to think about what needs to go into the Deliverable Goals (Storm the castle) and (Save the Princess). What do we need to bring? Who do we need to go with us? What are we going to do when we get there? Once we get in, how do we get the Princess? And on, and on. Notice the key thing here - there are lots and lots of questions. From asking the questions and figuring out the basic answers, we develop our progressively more detailed plan, with smaller and smaller goals under each higher level goal. If an item still seems too unwieldy to handle (like a broadsword to a dwarf), then you need to break it down still further. Oh, we almost forgot. We are planning a successful rescue, right? We had better plan for the Celebration of her return, as well - and start preparing details for that now! This is how the plan evolves. We add more levels, more detail, plug in new goals as we think of them, and our story - our project - grows. And quicker than you can say "What Dragons?" you will have a fairly decent strategy, plan, WBS, whatever - and you are all ready to go. Probably not done up in Microsoft Project, but at least sketched onto a nice piece of tanned goat hide you can roll up and take with you. Might even make a decent pillow! You may say "Pah, that's not a realistic example - you made a WBS from a story, for a story." Well, this is true, but I assure you the same methods and rules apply - whether it is rescuing a Princess, or migrating a Server Room across to the other side of town. Give it a try! The Scope Dragon. This dragon is sometimes referred to by other names, such as "Scope creep", "creeping elegance" and the like. Note the common word "creep". This type of dragon likes to creep around, sneaking up on you and present project changes when you are at your weakest. They try to represent scope changes as "Just a small feature, we meant to have it in the specs, so pleeeeease can you do it, just this time?" This dragon has a particularly smooth-talking voice, but still has a forked tongue. Resist this dragon and its convincing spells! Pull out the mighty Specification Document (or RFP) and point out quite clearly that what they are asking for "is not a little thing" and "is not in scope". The Cost Dragon. This dragon loves gold. Lots of gold. It likes gold so much that it will try to gold-plate everything. A deliverable looks ready to give to the customer, passed QA testing and ready to ship? Just hold on a minute, you need a bit of gold on those hubcaps. It is easy for this type of dragon to get out of control and consume your budget with much of the other work left incomplete. Beware this dragon, make sure that the team sticks to specs, delivers high quality - but no "gold plating". The Cost dragon will try to deliver a BMW when they paid for a VW; they confuse "quality" with "grade". The Quality Dragon. The cousin of this dragon is the Cost Dragon. This little guy hides within your ranks, and its works are not always visible until it is almost too late. This can be any team member who says "well, that should be good enough" but does not make sure that it matches the specifications. Be vigilant! You don't want your sword to break at the moment you need it the most. Quality is delivering what is asked for in the specs. If they ordered a BMW, don't deliver a Volkswagen. The Rumor Dragon. This dragon thrives on lack of coordinated information. Where there is a vacuum of information, this dragon will gladly fill it with whispers, innuendo and false information. Fighting off this dragon is relatively straightforward, but it is not easy. It requires that you develop a good Communication Plan, and that you communicate regularly to all of the stakeholder groups and users with good, solid information. Be consistent in your communication, and this dragon will wither on the sidelines. The Subversive Dragon. A cousin to the Rumor Dragon, this type of dragon usually takes a human shape in your project, and can be difficult to spot. They may flash a toothy grin in the status meetings, but all the while they slither around behind people's backs, whispering into people's ears and stealthily work to undermine the project towards their own ends. Even if you don't run into any of those, you will likely encounter the Time Dragon. This dragon eats up time, making things drag-on (and on and on) seemingly without any hope of reaching the light at the end of the tunnel. (In this case, we want to see daylight, not another dragon). If you never see a dragon in your project, you still have to be watchful for the Goblins. These can be spotted by the trail of wasted time, effort and money with little to show in terms of progress. (And perhaps a few mounds of bones in KFC buckets as well).These people are literally "gobbling up" your resources, impacting your bottom line, and slowing down the progress of your project, without contributing or achieving much from them in return. Watch out for the Project Goblins. I don't have anything in particular to say about these folk. They don't usually cause too much trouble. Even Ogres and Giants seem to manage just fine, as long as you remember to feed them a few whole chickens from time to time. 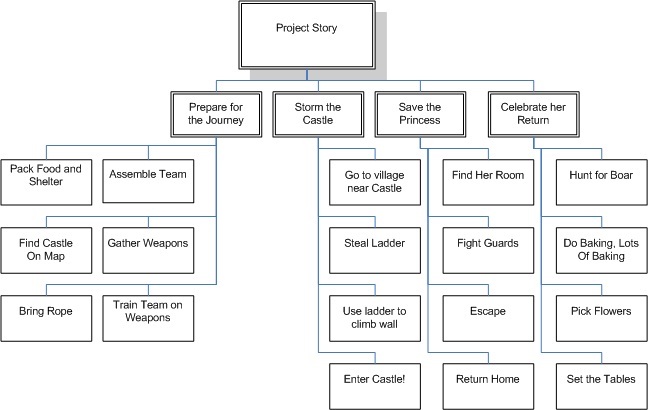 Ok, we have the basic layout of the story line – the plan elements - in the WBS. We also talked about a few dangers along the way. But what about the rest of normal Project Planning? What about sequencing, dependencies, duration, effort and the Gantt chart? Well, it turns out that anything we can put into a WBS, we can structure into a Gantt chart with all of the bells and whistles. In fact, when we look at it as a story, it is even easier to map out the sequencing and dependencies, including effort, duration, lead time/lag time and all the rest of it. Oh, and don’t forget to set your working time. They knocked off earlier than you do today - when the sun went down, it was just plain dark, except for your campfire. My son and I really enjoyed the book-signing session. After the session he signed books and posters, and we were 5th in line. My son got to sit beside the author for a photo, and he signed all four books (several quite dog-eared), plus the poster. A blockbuster day! And as for projects, they truly are stories. What kind of project story will you write? Many projects start out as Adventures, or sometimes Mysteries - and the way some salespeople respond to RFPs I am sure some customers might think their project must be a Fantasy. And no matter how straightforward our outline starts out for our story, there are always twists and turns, Drama and Suspense - and the occasional Horror story too. Good luck writing your projects, and I hope all your adventures end up with a victory feast in the Great Hall - and not with you chained up in the Dungeon. I am not sure about you, but I can't wait to read the next one! (Project, I mean). Although, come to think of it, I am also really looking forward to his next book...!